cardigans and kids: what's for supper? taco soup and cinnamon rolls. what's for supper? taco soup and cinnamon rolls. I'm a huge fan of chili. Taco soup is like chili, but faster and more in my family prefer it because I don't make it as spicy. 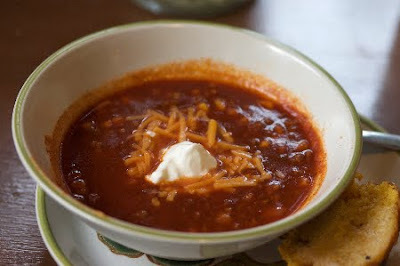 Since the high is 45 F and we have piano lessons - tonight is taco soup night. First cook the hamburger and onion (if you have already prepared your hamburger, just add your chopped onion into the large pot,it has plenty of time to soften and simmer). After the meat (and onion) is ready, in a large pot or crock pot, put your cooked meat, onion, and all of the remaining ingredients (except the fritos, cheese and sour cream). Let simmer for the afternoon. That is it. I call it my cheat recipe. My Mom serves it with her fritos in the bottom of the bowl. Some in our home like it like that, some like the fritos on the side. Most everyone likes both the cheese and sour cream on top.